When the arena team was taking to the ice for the first time, the internet was in its infancy. Few had access to it .. and if they did download speeds were around 9600 KBPS ( as opposed to todays 30MBPS+). That didn’t stop the fans though and many websites were created over the years that can still be seen today. The rebirth of the Manchester Storm saw an explosion of online information. Here’s our guide to what’s available, starting with active pages in the new era. 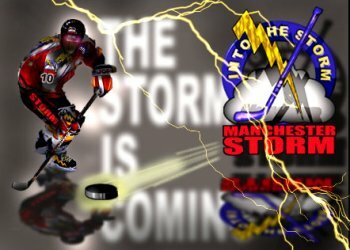 Thunderflash: The online Manchester Storm fanzine somehow made the transition from ye olden days to the new era. Many of the original websites from the Arena years are still online. Note that images etc tend to be small as the websites were designed to cope with very slow download speeds … and the sites weren’t designed for mobile sand tablets as they hadn’t been invented yet ! !